Vancouver, BC – April 9, 2018 - Zinc One Resources Inc. (TSX-V: Z; OTC Markets: ZZZOF; Frankfurt: RH33 – “Zinc One” or the “Company”) announces the first ever drill results have confirmed a new high-grade zinc mineralized zone at Mina Chica, which is one of several high-grade mineralized areas being targeted in the ongoing drill program at the Bongará Zinc Mine project located in north-central Peru. More importantly, these drill results penetrated as much as 16.5 metres of true vertical thickness with 36.5% zinc resulting in the base of mineralization at Mina Chica potentially being substantially deeper than previously contemplated. Zinc One anticipates that its new understanding of the high-grade Mina Chica mineralized zone will have a positive impact on the resource estimate at the Bongará Zinc Mine, which is anticipated to be released in Q2 2018. To date, assays for only 6 of 34 holes drilled at Mina Chica have been received and are reported herein. Visual zinc mineralization has been noted in the other holes and assays will be announced when received and data has been compiled. Mina Chica is only one of three known zones of high-grade near-surface zinc oxide mineralization along a 1.6 kilometre mineralized trend that will be tested by this drill program. At Bongarita, which lies approximately 200 metres west of Mina Chica, results from only 13 of the 36 holes drilled there have been reported. At Mina Grande Sur, which lies approximately 1.2 kilometres southeast of Mina Chica and where a second rig is currently drilling, results from only 11 of 54 holes drilled have been reported. Drill holes, MCH18001, MCH18002, and MCH18003 were drilled along the southern periphery of known mineralization near a pit sample that previously defined the base of the mineralization at 2.9 metres depth. 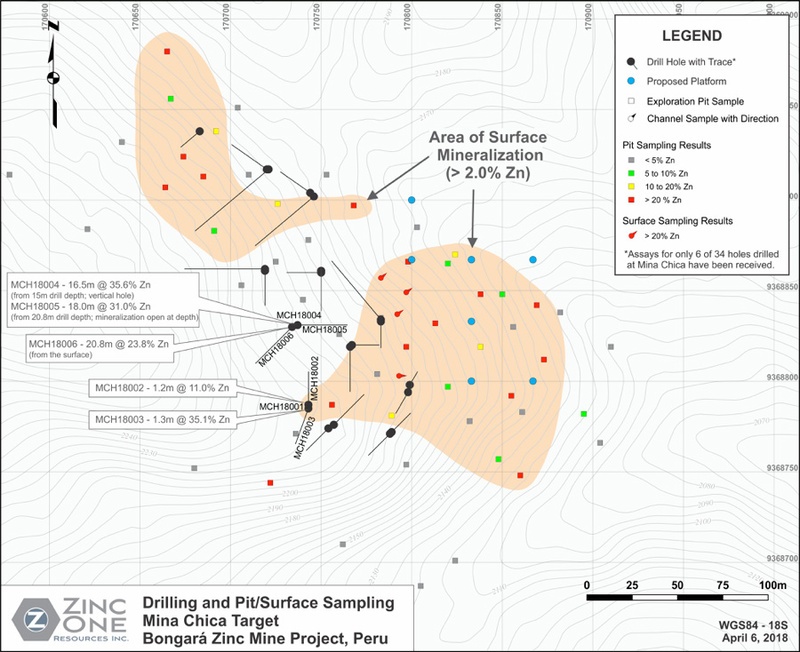 Significant results, including drill-hole orientation and total depths for Mina Chica, can be found in Table 1. 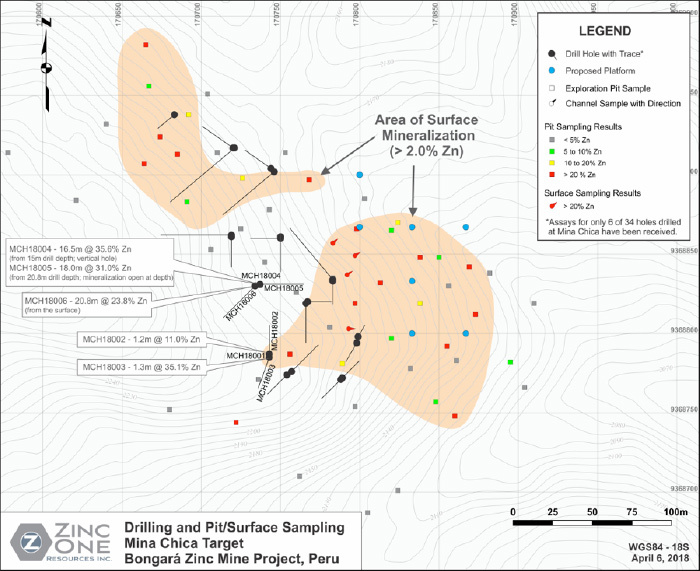 Below is a map in Figure 1. outlining the ongoing drill program at Mina Chica. A link to additional maps showing a more detailed view of the surface/pit sampling and drilling at Bongará is also provided. The sample from each core run is placed in a 60-centimetre long, plastic core box that has five columns. Core recovery, rock quality designation (“RQD”), and geologic features are logged and sample intervals, which are generally <2 metres, are chosen. Each core box is photographed and then sampled with a spatula (soil and heavily-weathered rock) or cut with a core saw, 50% of which is placed in a sample bag and stored on site in a secure location. The Company independently inserts certified control standards, blanks, and duplicates, all of which comprise approximately 30% of the sample batch, to monitor sample preparation and analytical quality. The samples are stored in a secure area until such time they are shipped to ALS laboratory in Lima (ISO 9001 Certified) for preparation and assay. At the laboratory, samples are dried, crushed, pulverized and then a four-acid digestion is applied. This is followed by the ICP-AES analytical technique for 33 elements, including lead. The same method is used to assay zinc for values up to 20%. If zinc exceeds 20%, it is then analyzed using a titration method. The laboratory also inserts blanks and standards as well as including duplicate analyses.